Discussion in 'Android Tablet Q&A' started by ChuckieFinster, Nov 11, 2010. I just read about the Galaxy tablet coming to sprint, and man o man am I excited!!! Galaxy with sprint speed will be sensational! But i've been wondering if there is a way to connect tablets to micro or pocket projectors!??? Just the thought of displaying Angry Birds on 50 inches is too much to handle haha. Does anyone have any suggestions or ideas about this!? A little bit more research and I think Ive found it!! I found this little gem on Engadget today! 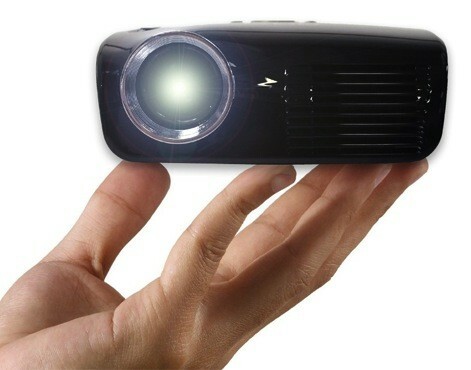 Its called a micro projector. The newest one to come out is by Aaxa tech. The model is M2, and from the posting it looks like a real winner. 110 lumens, XGA, and HDMI port. I'm gonna wait for some pictures to come out and then decide if I should buy this. If the tablet has HDMI output and the projector has HDMI input there shouldn't be any problem connecting them. I just went to AAXA's web site and it says the projector has an HDMI port on the back, all you'd need it the correct cable. Of course some tablets (I believe the GalaxyTab is one of them) require an HDMI adapter that plugs into their 30-pin data port. OffWorld, thanks for your help! I decided to get one!! Did you have to purchase any other accessories besides the projector?